Total income of $7.66 on approximately 25,000 AdMob impressions with an impression RPM of $0.31. 266 installs on Android with 15 reviews and an average rating of 4.47. The app was installed by almost 25% of users who viewed the Google Play store listing. 72 iOS installs on 495 App Store views. Seven 5-star reviews and one 4-star review. Roadball Rally was a complete commercial failure. I wasn't expecting much but I was hoping to earn enough to recoup the cost of the Mac Mini I purchased in order to release the game on iOS. Since the release I've attempted to promote the game on Twitter, YouTube, and various forums. I've gained over 450 Twitter followers and the YouTube trailer has over 4,000 views but the time consuming attempts at promotion have not resulted in any significant bumps in installs. Roadball Rally is practically invisible on the App Store and Google Play with only direct searches for 'roadball' or 'roadball rally' leading to store listing views and app installs. After the Roadball Rally update I will make another attempt at promoting the game. I also plan to start brainstorming ideas for a new game. Hopefully I can take what I've learned from Roadball Rally to create a unique, fun, and successful new game. 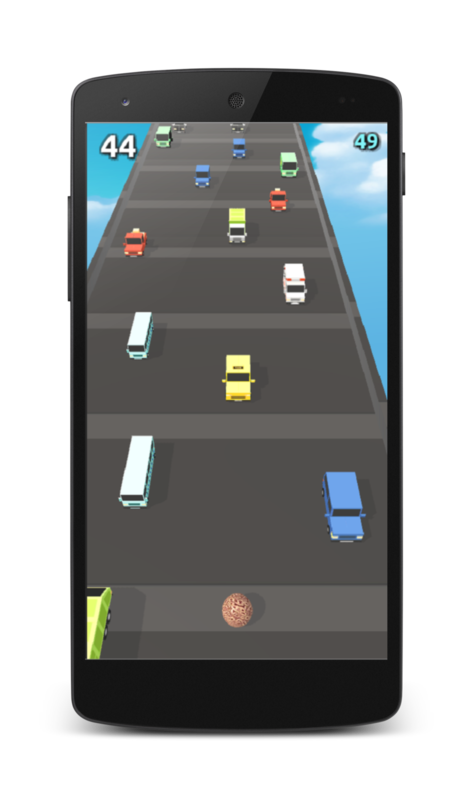 Roadball Rally has now been available for two months on the Google Play store and one month on the App Store. The numbers are still very small. Approximately $3.00 in ad revenue on a bit less then 12,000 ad impressions, around 100 installs, and a few mostly positive reviews. The numbers are split almost evenly between Android and iOS but the game has been available on Android for twice the amount of time. My attempts at promoting the game have not had much success. I've published a gameplay trailer to YouTube, created a Facebook page, and shared screenshots and videos on Twitter using the popular #indiedev and #gamedev hashtags. None of this has led to an appreciable increase in installs outside of family and friends. The release of Roadball Rally has been a personal success but a commercial failure. It has been a great learning experience, an excellent conversation topic, and a fun game to play with my family but it hasn't generated any significant interest or income. I still haven't given up, with an updated iOS version soon to be released, I'm planning another marketing push on Twitter and YouTube. And if that doesn't work, I think I'll take what I've learned and make another game. One important advantage Unity has over other game engines is the Unity Asset Store. The Asset Store is an excellent resource for developers with a huge variety of free and paid 3D models, sounds, and scripts available to include in your project. After experimenting with Blender and researching some of the expensive commercial alternatives, it quickly became apparent that I would need help building the graphical assets for RoadBall Rally. Finding suitable assets for your project is a time consuming effort that will involve lots of experimentation. To keep my project clean, I created a separate test project that I would use to import and test assets. In the end I used a number of textures and materials from Yughues who offers a large number of popular and free material packs and I purchased the Simple Town environment from Synty Studios mostly for the car models. Other packages I used were the Gamestrap UI GUI skin for the initial versions of the buttons and the Univeral Sound FX package from Imphenzia for some of the sound effects. In my experience the texture and materials assets are a great resource for first time and indie game developers who may not have the technical or artistic ability to create their own graphical assets. I'm more reluctant to use the scripting assets in my project. In most cases it is easier to write the code myself then depend on 3rd party scripts. I also want to make sure I understand all the code in the project and that I'm not depending on 3rd party code that may be abandoned in the future.